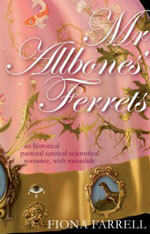 Mr Allbones’ Ferrets: An historical pastoral satirical scientifical romance, with mustelids, by Fiona Farrell (Vintage, 2007), 217 pp., $27.99. Growing up in rural Southland, I was aware of a powerful and supposedly benevolent body called the Acclimatisation Society, which – so I gathered – had the job of ensuring that river, stream and field were stocked with the fish and game best suited to delight the nation’s anglers and hunters. As I grew older, I learned that these benevolent overlords of the natural world were not, in fact, so benevolent after all, and that the story of ‘acclimatisation’ was a story of disaster after disaster, as wave after wave of English fauna was imported and let loose on native ecosystems ill suited to receive the aggressive intruders. First the accidental releases of rats, mice, cats — then the deliberate; surely the rabbit, so charming on an English sward, would prove no less charming hopping about on a New Zealand meadow? When the rabbit proved to be an all too successful immigrant, threatening the pasture on which the colonists depended, then an even more fateful decision was made: to import their natural predators, the weasels, stoats and ferrets, to control them. The Acclimatisation Societies are all Fish and Game Councils now, and wiser with it, but the consequences of their past diligence are all around us, in silent forests and empty nests. Therefore, it was a bit of a stretch for me to take on the task of reviewing a novel, set in the 1880s, in which the protagonist is a man whose job it is to catch ferrets and transport them safely to New Zealand to control the rabbit problem. But I have read and enjoyed books about unpleasant professions before — Gene Wolfe’s Shadow of the Torturer, for one — and I enjoyed Mr Allbones’ Ferrets too. The novel does pretty much what it says on the tin: it’s historical, it’s pastoral (at least initially), there is science afoot, there is a romance, and, by George, there are mustelids aplenty. I didn’t really notice the satire, but there are strong doses of dramatic irony. To fit all that in 217 pages is a challenging assignment for any author, but Fiona Farrell’s assured command of literary technique means that Mr Allbones’ Ferrets rises to the challenge, though not always without strain. It’s not a criticism of this novel to say that the most memorable characters are the ferrets. The novel opens with a marvellous set-piece in which we see Walter Allbones going about his business, and his favourite ferret going about hers, in a happy if risky concord. For Walter Allbones is a poacher; he poaches rabbits, and Pinky the ferret is his chosen implement. In a scene so vivid it will stay with me long after the plot of the novel has grown hazy in my memory, we learn how poacher and ferret work together to lay pink, juicy rabbit on the table. By the end of this scene, I was on the side — for the duration of the novel — of Allbones and his ferrets, and also confident that I was in very good authorial hands. Then, on his way home with his spoils, Allbones runs into trouble, and that trouble leads him, all spit and polish, to the door of the big house at two o’clock on a sunny afternoon. Mr Pitford, a gentleman, has need of a man who knows his way around a mustelid, for Mr Pitford is in the business of acclimatisation, and the colonists in distant New Zealand are crying out for help with their rabbit problem. And Mr Pitford has a granddaughter called Eugenia — a young, beautiful, granddaughter, with whom Allbones is smitten, and who in turn does not seem entirely immune to his rustic charms. And this is where I went ‘uh-oh’, for in a thousand novels and films Ken Shabby, the tramp/poacher/gamekeeper, has lusted after Rosemary, the virginal daughter of the manor; and in a good proportion of those, Rosemary has raised his station or lowered hers. How could Fiona Farrell bring anything new to this well-worn trope? To make life even tougher for Eugenia, she is also Exposition Girl, tasked with bringing Allbones up to speed on the Theory of Evolution and the inevitable extinction of weaker species, and in general to show Allbones and we, the readers, how the Victorians rebranded Darwin’s work as a moral justification for their own rapacious colonialism. So, after the vividness of the opening scenes, I found this section of a novel something of a let-down. Of all the major characters — Allbones the poacher, his rival/tormentor/reluctant ally Metcalf, Pitford the paterfamilias — it was Eugenia I found the least convincing. Nevertheless, developments late in the novel do provide a retrospective explanation for much of her behaviour and her character. Her given name is surely no accident. But then the chief dramatis personae and their horde of ferrets take ship for New Zealand, and we get the second of the great set pieces — set pieces which, though it is high praise indeed, reminded me in their intensity and vividness of the great mowing scene in Anna Karenina. Fiona Farrell gives us a panorama of the colonists boarding the Adam and Eve, 999 tons and bound for Wellington direct, with the rich well-housed, the poor crammed into narrow berths, and the ferrets, securely caged, standing between them. The terrors and pleasures of the journey to New Zealand are well described, but what stuck with me most vividly was the sense that, on such a voyage, the social order was being overturned as well as the seasons. In a new land, the poor may rise, but so too the rich may fall. Chance, circumstance, and old sins brought to light can lead to new dispositions. Walter Allbones and his kin have faded into archival records, old photos, and genealogy, while Pinky’s descendants are very much with us. Well done, that man! In Australia, I once stayed in a house run by ferret breeders. A ferret tried to get into my sleeping bag. I had to leap in the air and shriek before it saw reason. I don’t like ferrets very much. I did like this novel.